Scarves are among the most versatile gifts, suitable for anyone from a hard-working assistant to a hard-to-please mother-in-law. And what could be better than a scarf in which every stitch has a positive story to tell? Recently I have come across three brands, all founded by women with a connection to Switzerland, which offer chic scarves with a purpose. pink maharani’s journey started with an innocent conversation where our two co-founders randomly met at a teashop in Geneva and shared their passion for India. Thais Grange, inspired by her entrepreneurial mother, always wished to have a brand of her own. Narmada Ramakrishna, on the other hand, was on the lookout for a connection between entrepreneurship and social impact. After much research and travelling, they found their maharani, queen of all cashmere wool in the highest plains of Ladakh — known as India’s “Little Tibet” — where their scarves are hand-woven and hand-embroidered by skilful local artisans. But the shawl’s impact goes well beyond the local community in Ladakh. The moment a pink maharani shawl adorns your shoulders, you change the life of one teenage girl from the urban slums of Bangalore, India, by providing essential sanitary products and education about the menstrual cycle, thus enabling her to continue with normal schooling without having to drop out, which is currently the case with 1 in 5 girls. The shawls also help ensure a brighter future for children living in the remote regions of India with no or limited electricity. Each shawl purchase supports an ingenious school bag with embedded solar panels, which charge during the day as the kids walk to school and provide up to five hours of light in the evening. Founded by two sisters, Shenila and Anila, SHENNANZ is a sustainable fashion design house created with the aim of erasing the boundaries between people and diverse cultures and act as a bridge between them. With roots in Pakistan and a presence in Switzerland and the UK, SHENNANZ designs feature western silhouettes adorned with artful eastern embellishments, which have been shown at this year’s London Fashion Week. SHENANNZ printed and embroidered chiffon and silk scarves would make a perfect gift for a fashion-conscious globetrotter. In terms of social impact, SHENANNZ Foundation aims at providing access to high-quality Montessori education for underprivileged boys and girls in Pakistan. With the world seeing the highest numbers of refugees and forced migrants since World War Two, SEP Jordan is based on a strong conviction that refugees have the right to employment, education and empowerment. 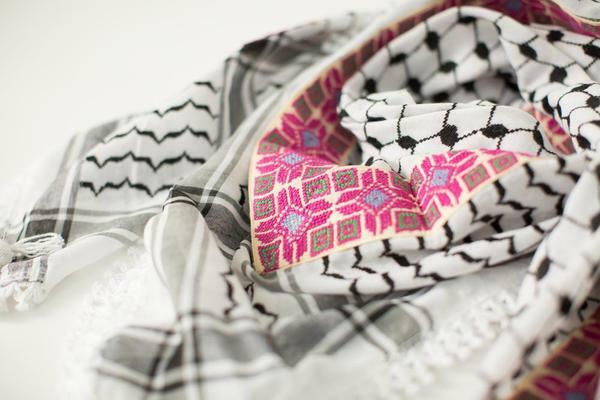 Founded by Geneva-based investment manager Roberta Ventura, the brand offers scarves and home accessories made by women refugees in the Jerash camp in Jordan, who treasure the cross-stitch technique that has been passed down from generation to generation. In this festive season, choose a gift that keeps on giving. Happy Holidays! Thank you! And what a truly lovely scarf with a story to tell! !